Was the real Vitale depicted on stamp? Portrait allegedly showing Vitale on which the stamp is based (private collection). The 50c stamp purportedly depicting Emmanuele Vitale. Right: A portrait by V. Fenech of the Knight Commander and Governor of Fort Tigné, wearing the artillery uniform. 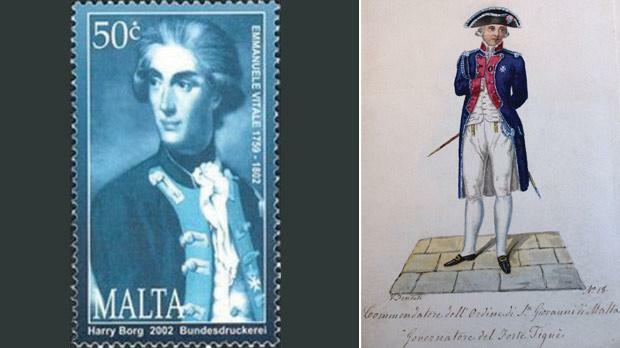 A Canadian friend of mine, who recently started collecting Maltese postage stamps, has sent me a curious enquiry related to one of the stamps of personalities issued in October 18, 2002 – the 50c stamp depicting Emmanuele Vitale (1759-1802). Since my main interests include Maltese military history, and especially uniforms of Malta of the later years of the Order of St John and of the 19th century Maltese Corps of the British Army, he wanted to know about Vitale, his place in Maltese history, and this stamp. To be quite honest, I haven’t paid much attention to Maltese stamps since the set depicting Maltese uniforms was issued on July 23, 1988, and I obviously wanted to give my friend details that were as accurate as possible. So I delved further into the subject, examining the stamp and the person it allegedly represents. The stamp is printed in a bluish monochrome which did not give me much to go on. Thanks to a local source, I was able to obtain a scan of the photo of the portrait on which the stamp was based. The portrait shows a figure in a blue and red uniform and three soldiers grouped near a tent in the rear on his left. Something about this figure being Vitale did not look right and that is where I referred to all the information I could find on Vitale and on that particular uniform. The uniform on the stamp is identical to that of an officer of the artillery of the Order of St John, as shown in a number of paintings and illustrations, especially by Favray, Zimelli and Fenech towards the end of the 18th century and very early in the 19th. The same pattern of dress is reputed to have been worn by the military engineers of the Order, which was identical to the uniform worn by the Marine Artillery of the French navy between 1778 and 1883. In the portrait and stamp, the coat has a gold-fringed epaulette on the left shoulder, denoting an officer of middle rank, while on the left lapel is the eight-pointed cross of the Order with the closed crown above denoting a professed knight. Partially visible under the lace cravat in front is what could possibly be another decoration or cross as worn around the neck. Maltese were accepted into the Order only as Knights of Grace during the later years of the Order’s presence in Malta. Although they are small and very faint, two of the three men in uniform seen in the portrait are wearing the green coats of the Falconieri and the third wears a blue coat with red facings like the main character. Emmanuele Vitale was elected councillor of the Università on March 23, 1785 after the death of his father Salvatore, a post he held until 1795. Following the arrival of the French in 1798, he was appointed Justice of the Peace for the municipality of Żurrieq. When the Maltese rebelled against the French, Vitale, along with Santu Formosa and 65 men, attacked the French garrison at Mdina and took the city. That same evening Vitale was appointed Commander-General of the Maltese insurgents. Later, during a meeting of the National Congress of February 11, 1799, he was elected representative of Mdina, Rabat and Casal Dingli, with the approval of Sir Alexander Ball, who had been elected president of the Congress. After the capitulation of the French and the end of the British naval blockade, Vitale was appointed Logotenente of Senglea until he was transferred to Gozo to direct the Sanità. He died shortly after, on October 8, 1802. Therefore, it is very unlikely that the figure on the stamp is that of Vitale, considering that he had never held a military commission in the Order of St John nor was he ever appointed within its ranks. 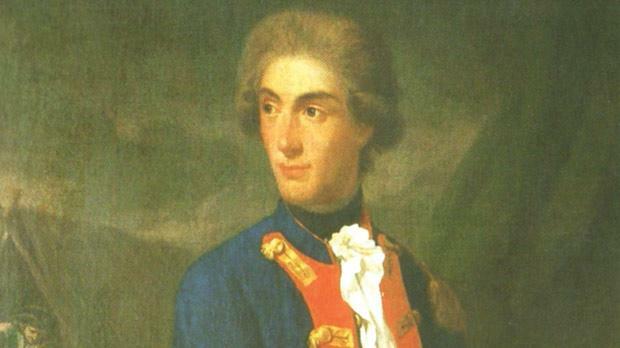 If Vitale had worn a military uniform, it would have been similar to those shown in portraits of Logotenenti such as Filippo Castagna and others. This uniform is very British and of a post-1800 cut, being the blue coatee with turn-backs, crimson facings and golden lace similar to the one worn by officers of the Royal Regiment of Artillery of the time. So based on these facts, I believe that the officer shown in the portrait and stamp could not be Emmanuele Vitale but some knight of the Reggimento dell’Artiglieria e Bombardieri of the Order of St John.